← Is it Art or Design? I’ve never seen this happen before. 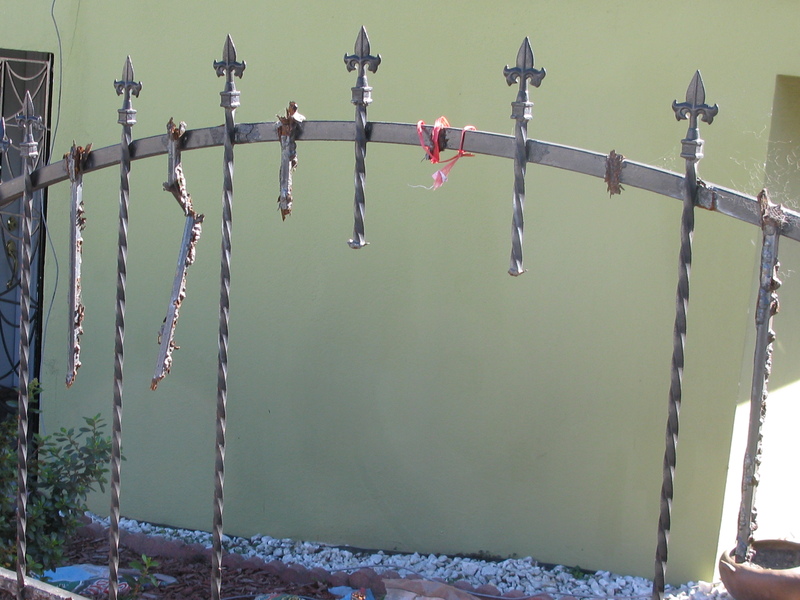 A fairly new, five maybe six years old, iron fence practically dissolving before my, and the home owner’s, eyes. Such a sad and wasteful sight it is especially in light of the fact that this ornamental fence looked so impressive and strong when it was installed. Plus, it added a necessary touch to an otherwise unremarkable house. The owners of the home spent a lot of money building the brick wall that supported the fence as well as the fence itself that, when completed, looked really good. The iron made a bold statement of containment, boundary delineation and yet, because it was open (the bars being thin and spread apart, as well as being low), friendly and non-threatening, it was a nice addition to my neighborhood. Those good qualities have all vanished with the poor choice of metal. 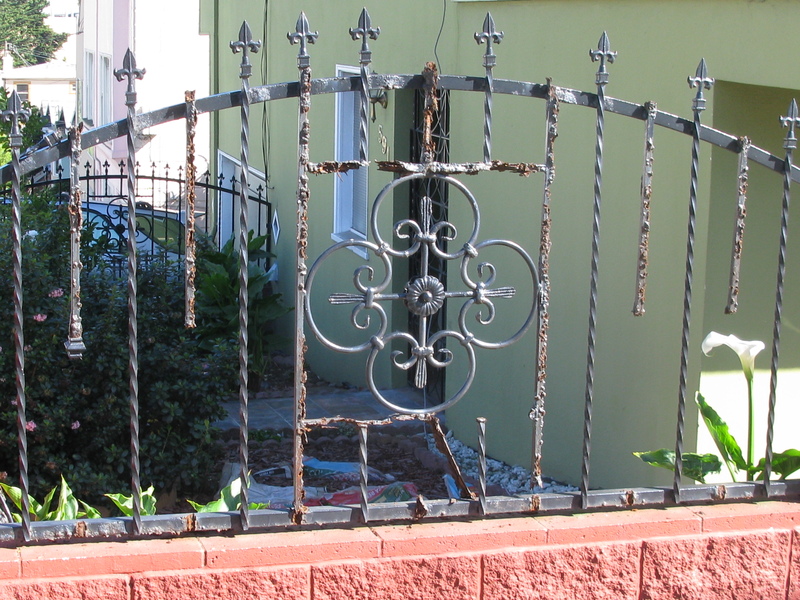 A ruined fence like this degrades the appeal of the house and lowers the overall visual appeal of the street. And the longer it remains, the worse everything associated with the fence gets. This nice house has become an eyesore because of this fence. How did this happen and how can you avoid it from happening to you? Beware of iron fences! Iron is the only metal that contains iron oxide. It is this element that rusts. Iron that is plated with a non rusting metal, such as zinc or aluminum, would be a much better choice for braving the elements. Particularly wet, or foggy weather like we have a lot of in San Francisco. Personally, I love the look of iron. I love it for furniture, decoration and fences but to see it reduced to fragments of its formal self, is a waste of money. This is another example of a good intention gone bad. 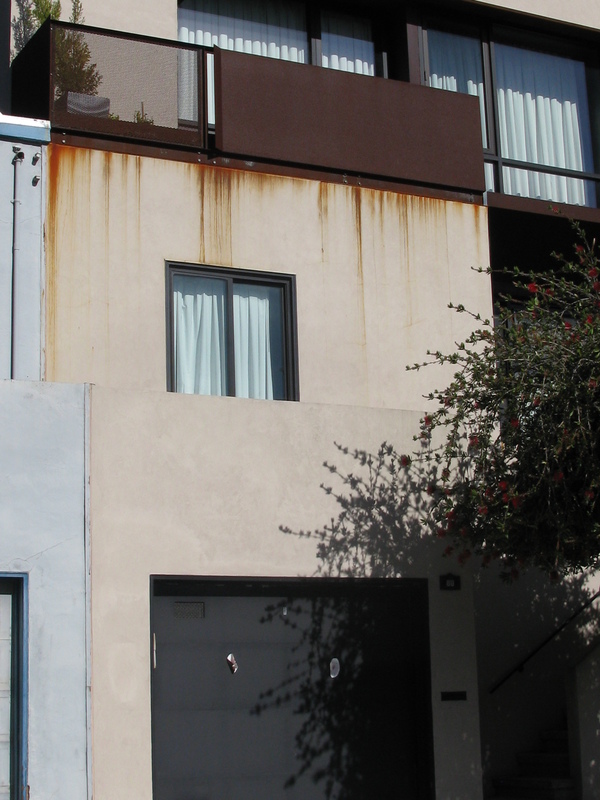 Not only is this wall eroding, it’s leaving an ugly rust stain on the face of the house. The face being the side most visible and usually most ornate side of a house or building. Sometimes the face of a building is actually the back side, where only the inhabitants or their guests can enjoy its beauty. However, since I’m not able to see the back side of this house, I’ll assume the front is the face, and frankly, this one’s face is a real mess. 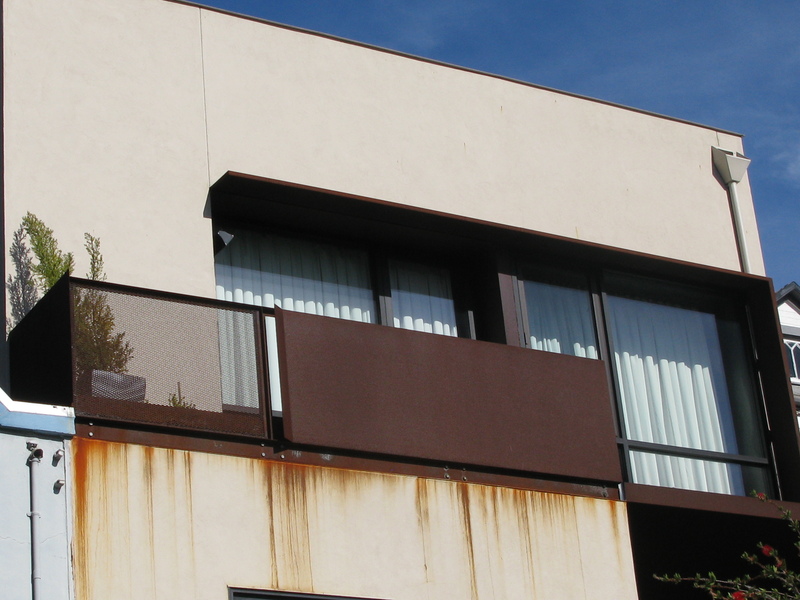 Now someone, possibly a designer, was a designer involved in making the decision to install a heavy iron fence around this balcony. I like the fact that they kept 1/3 of it open and although the house itself is rather bland and boring, the addition of this detail, when it was new, undoubtedly added a touch of interest or boldness to the flat, rectangular design. Today, I bet the owners cringe, as I did, every time they see those stains on their way inside. It is possible to blast those stains off the building but it’s only treating the symptoms of the problem and is not a cure. Every time it rains, which it does a lot here, those stains will reappear and every time they do, they’re telling the owner that their investment in that fence was a mistake and soon, holes are going to appear and get larger. So that whatever the owners were hoping to contain on that balcony, is eventually going to end up broken on the sidewalk below. So think about the composition of the products you’re investing in for your home. Ask your supplier if you can see real examples of them, not just in the showroom or their portfolios but outside, in the real world. Find out where they did their work at year or two ago and have a look for yourself. Knowledge is power and to a retailer, noting is more powerful than money. So get some knowledge, build your buying power and create a beautiful, weather proof, long lasting fence that you and your neighbors will love for years and years.